As noted in my previous post, we’re about 1/4th of the way through the NBA season. There’s very little time to reflect, however, as there are 10 games scheduled tonight. There are a couple nice matchups in Pelicans-Mavericks and Rockets-Warriors, some lopsided ones in Knicks-Spurs and Clippers-Pacers, and finally some in-between, perfectly mediocre games in Celtics-Hornets and Heat-Nuggets. WHAT A GREAT NIGHT. I actually looked at which games applied to each of those categories over the first fourth of the season, measuring them by Basketball-Reference’s metric labeled SRS, or Simple Rating System. SRS takes into account a team’s point differential and strength of schedule. It is not a perfect metric, ignoring wins and losses as I’ve explained here, but to me it’s better than looking strictly at margin of victory, among other statistics. For reference, the Golden State Warriors currently have the best SRS at 9.54 while the 76ers have the league-worst at -11.89. Anything above, say, 5.00 is very good. I like the metric, so I’ve kept track of every team’s SRS on game nights. The first couple weeks were cut out from this post, though, because SRS needs to even itself out over the first handful of games or so. We will always have the -22.20 from New York and +25.46 from Golden State on November 2. There are some expected teams like Memphis and Dallas, but hello Toronto and Sacramento! The Kings, partly from being without DeMarcus Cousins, now have an SRS of just 1.96. Toronto, meanwhile, currently has the second-best mark in the league at 8.15. Unsurprisingly, a lot of teams from the West are listed here. So much tire fire, or dumpster fire? Any game featuring the 76ers rounds out the top five, but New York and Minnesota are also included in a decent amount. There is also Oklahoma City in one game. This may be #BOLD, but with Kevin Durant and Russell Westbrook back that team will likely never add to the 10 worst matchups. Looking ahead, it’ll be “interesting” to see if a game with two teams’ SRS’ summing to a total of -20.00 or worse happens again. 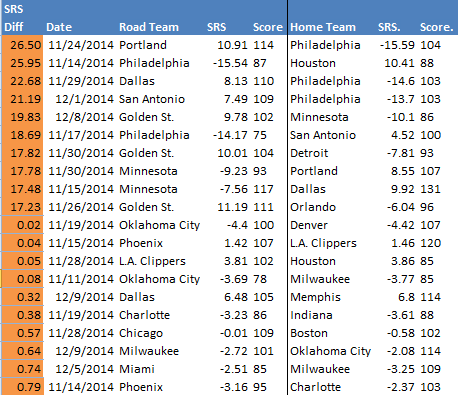 Only the 76ers and Timberwolves have an SRS of -10.00 or worse while third most-embarrassing Detroit sits at -7.63. The next 76ers-Timberwolves matchup takes place on January 30. Mark that down, figure out what kind of unsatisfying dinner to have, choose your least-favorite Gatorade flavor, and we can all be miserable together. Tonight’s Portland-Minnesota game barely misses out on the 10 largest differentials. Surprisingly, some of those games in the screenshot have been pretty fun, or at least close. The team with the worse SRS in those matchups is, to no surprise, 0-10. The home team in the 10 most-even matchups, at least by SRS, is 8-2. Most look decently contested, but we’re not taking into account rest advantages, injuries, players returning from injuries, etc. Again, Oklahoma City is likely to see a rise in their SRS, the Kings may continue to dip, Detroit’s should be twice as bad for being as disappointing as they are, and Golden State should get a boost just because. Maybe I’ll make a new metric called SoupRS. If a team was a soup and I had a spoonful, my reaction would either hurt or help their original SRS. Basketball stats: Tasty, edible, digestible?